In December, when most of the outdoors is either white or brown, I am immediately attracted to anything small and green. Yes, hemlocks and pines are magnificent, but I have a special love for non-woody evergreens. Many of these are introduced, so the native ferns, with their delicate fronds standing out so well against the winter woods, are my special favorites. 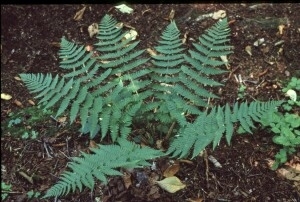 The Finger Lakes have several species of evergreen ferns: the common polypody (Polypodium appalachianum and P. virginianum), ebony and maidenhair spleenworts (Asplenium platyneuron & A. trichomanes), Christmas fern (Polystichum acrostichoides), and two woodferns, (Dryopteris intermedia and D. marginalis). 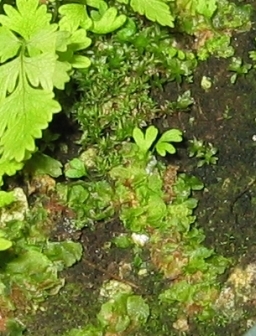 The spleenworts are small, the polypody mostly on rocks, so the most visible ferns in December are the Christmas fern and the wood ferns. Since the Christmas fern is so easy to recognize (look for the "stockings"), I am focusing on Dryopteris intermedia, the intermediate wood fern (<- photo to left)and D. marginalis, the marginal wood fern (photo to right ->). Dryopteris intermedia: Wisconsin to Newfoundland, south to Alabama & Georgia at high altitudes (ref 3,5). Found in nearly every county in New York (ref 1). Very common & widely distributed except on heavier soils, found in damp woodlands and ravine banks, in rich acid or subcalcareous humus (ref 6). Dryopteris marginalis: Wisconsin to Newfoundland, south to higher altitudes in Oklahoma & Georgia (ref 3,5,10). Found in all counties in New York, as is D. carthusiana (ref 1). A common fern, found on wooded slopes, especially ravines, in light humus over both acid & calcareous soils (ref 6) and on roadsides & rock walls (ref 9). 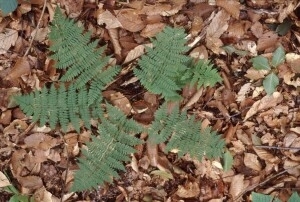 Both evergreen wood ferns are upland species in New York, although D. intermedia is also found in wetlands in north-central U.S. (ref 3). All Dryopteris spp. are NYS DEC Protected as exploitably vulnerable (ref 2), so cannot be collected without permission. Both D. marginalis and D. intermedia are listed as G5, S5, i.e. demonstrably secure, both globally and in NY State (ref 1,11). 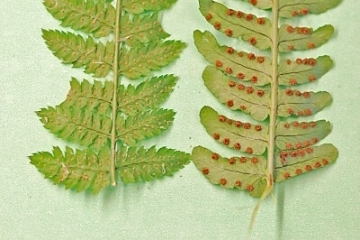 Dryopteris spp. are readily spore-propagated for use in gardens. Spore propagation techniques are described in many references; I like the detailed description in Foster (ref 5). I simplify by using plastic containers in loosely closed plastic bags, but the basics are the same. Dryopteris intermedia is hardy to USDA zone 3 (ref 9) and is happiest in the garden in deep rocky neutral to slightly acid soil that is rich in humus. It needs shade and is particularly happy (and pleasing) at the base of boulders (ref 4). Sources differ on water needs, some saying it needs moisture at all times, but Leopold says that in this area it can take some dryness once established (ref 8). Dryopteris marginalis is hardy to USDA zone 2 (ref 9), preferring deep stony, well-rotted leaf compost, in full to open shade (ref 4). Again, boulder bases are good spots, and the water recommendations range from keeping moist to "very drought tolerant once established" (ref 8). The fertile leaves of D. intermedia appear first in the spring; sterile leaves are similar in shape but smaller. Dryopteris intermedia & D. carthusiana are commonly used by florists (picked mid-summer & held in cold storage). Dead matted leaves surrounding the crown of D. marginalis can help stabilize soil on slopes. Some Dryopteris spp. have poisonous roots, and although medicinal uses are listed, they are thoroughly circumscribed with precautionary statements due to possible toxicity. 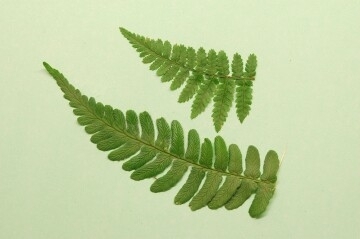 Dryopteris spp. hybridize in the wild. The diagram for known hybrids in Flora of North America (ref 10) looks like spaghetti. No wonder there are so many not-quite-on-spec examples out there.